I recently took a trip to Dublin, Ireland and decided to stay a few extra days to soak in the city and a bit of the countryside. On a last-second hunch, I decided to take my clubs and see if I could fit in a round of a golf since the weather looked to be good enough to get out and play. I’m glad I did. Due to my last-minute decision – I had to find a resort and an opening to play golf in just a few days. 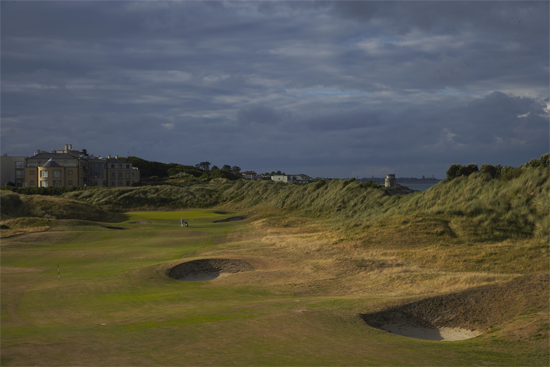 I ended up staying and playing at Portmarnock Hotel and Golf Links located about 30 minutes from downtown Dublin on the Irish Sea. 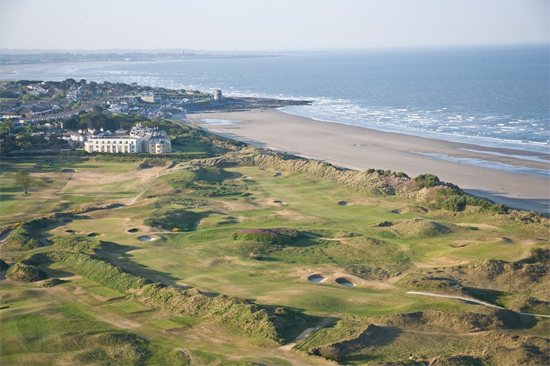 The hotel and course are built on the former Jameson Whiskey family estate, so I felt a strong-enough connection and assumed that I would be able to have an epic 19th hole session. The course was originally home to the Jameson family’s private golf course. The current course was designed by Bernhard Langer and has kept much of the original layout. I didn’t have a lot of time between arriving in Dublin and teeing off. I was scheduled to arrive at around 6am and my tee time was for a little past 10am. I thought this would be enough time but the airline and taxi situation made this much closer than I would have liked. I ended up changing in the clubhouse, storing my luggage, and heading straight out to get warmed up after arriving at the hotel. I was pretty bummed to find out that there wasn’t a driving range onsite – although I did get a chance to putt and chip for 20 minutes or so before heading out to start my round. One of the first things I noticed standing on the first tee was that the course guide was printed incorrectly. The scorecard shows the hole as a mirror image of how it actually played. Not sure what happened with the course guide there, but the rest of the holes ended up being correct. Another relatively immediate observation was that the yardages were all in meters instead of yards. Everything I hit seemed to be a little off and it actually took me a few holes to figure out that I was looking at the distances a bit differently than I’m used to. All-in-all, I played so bad that it really didn’t matter – but it is worth thinking about if you are heading outside of the US. I already noted that my game wasn’t really on – so all I can really say is that the course was enjoyable enough to keep me smiling despite my uncooperative swing. The course is laid out as a standard links course and the majority of the course was more than enough to challenge my game. I (somehow) managed to avoid the majority of the deep pot-bunkers, but I certainly found my share of the wild grasses that are stretched along the majority of the close to 7,000 yard course. After the first few holes I had a deep appreciation for the lack of cart paths and the realization that everyone on the course was walking. There’s just something magical about seeing everyone on the course walking and playing the game like it was meant to be played. I also really appreciated the layout of the course and the playability of the holes. I wasn’t there during the best time of the year – so it was really nice to see the course in great shape while many of the other courses around the area were closed. The course was rarely tricky (beyond the wind coming off of the water) and it played mostly straightforward. 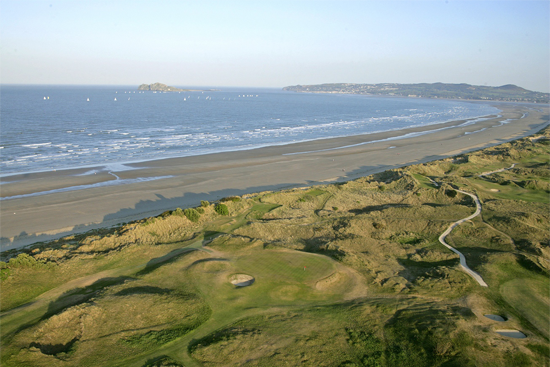 The holes that stood out the most were the ones located on the dune side of the links (8,9,10, and 11) due to the scenery and views of the Irish Sea. The fairways were simply incredible, the greens were large and plush, and the 98 bunkers were certainly a welcoming challenge. I had a wonderful time and enjoyed everything from the courteous staff to the entire experience of playing the course. The 19th hole was all that I dreamed it would be and I enjoyed my time hanging out around the hotel for the remainder of my stay. 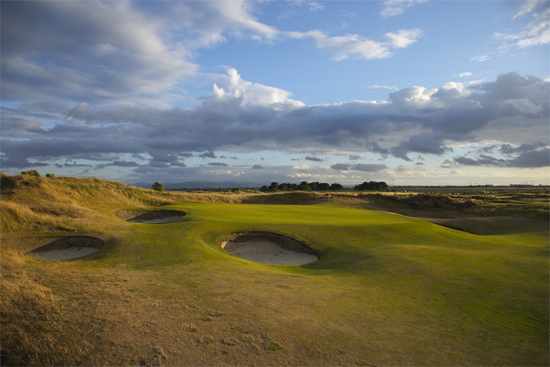 If you’re looking for a quick detour from the city in Dublin, The Links at Portmarnock is a nice side journey to experience some great golf in Ireland. 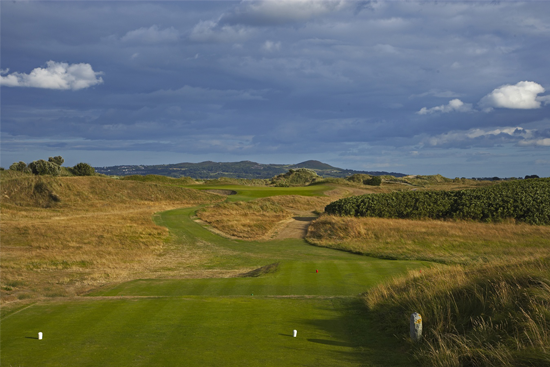 If you’d like to see some additional pictures of The Links at Portmarnock, you can checkout the Portmarnock photo album that we have posted on Facebook.